This was the starter dish to one of the best meals I’ve ever enjoyed. 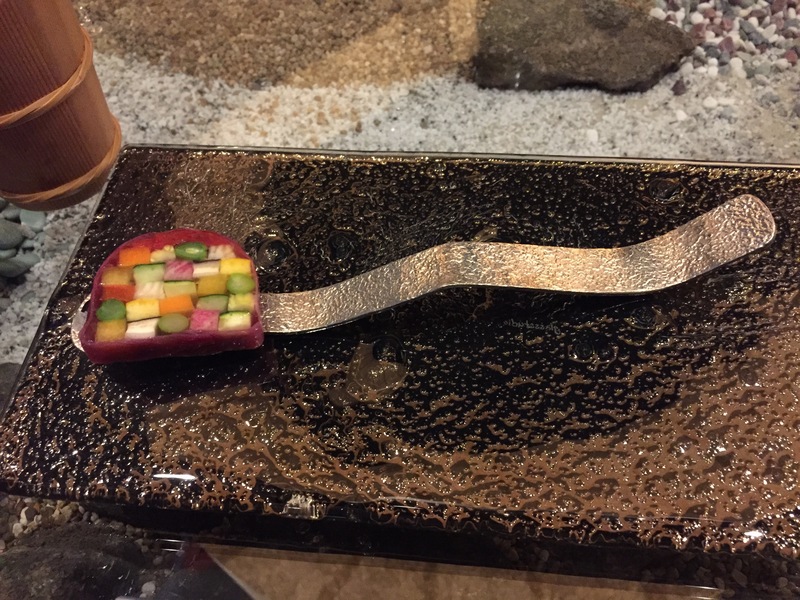 This was part of an omakase (chef choice) meal of sashimi, sushi and salad. 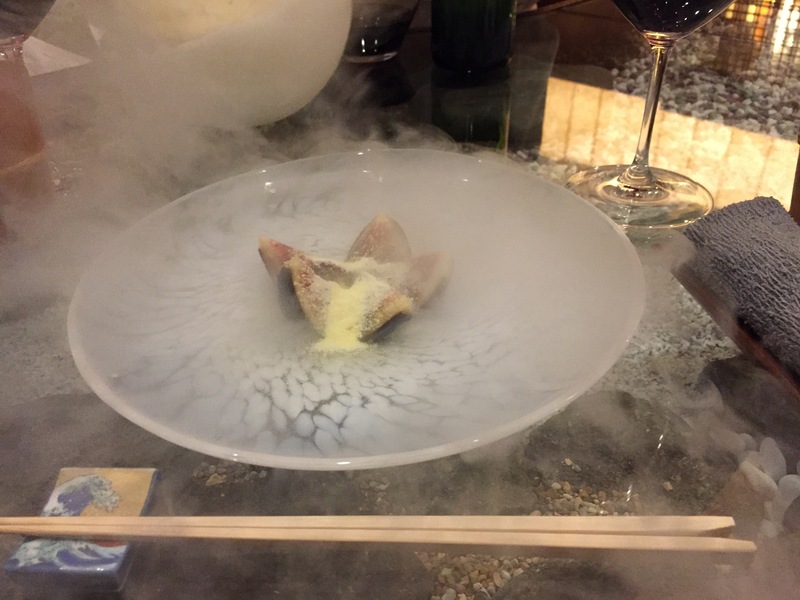 The food was incredible and the servers and chefs were not only highly skilled at what they do but we’re also very friendly with the guests. It was a full house (seats about 14). Today we traveled to Nara which was about a 50min subway ride from the station just outside of our hotel. 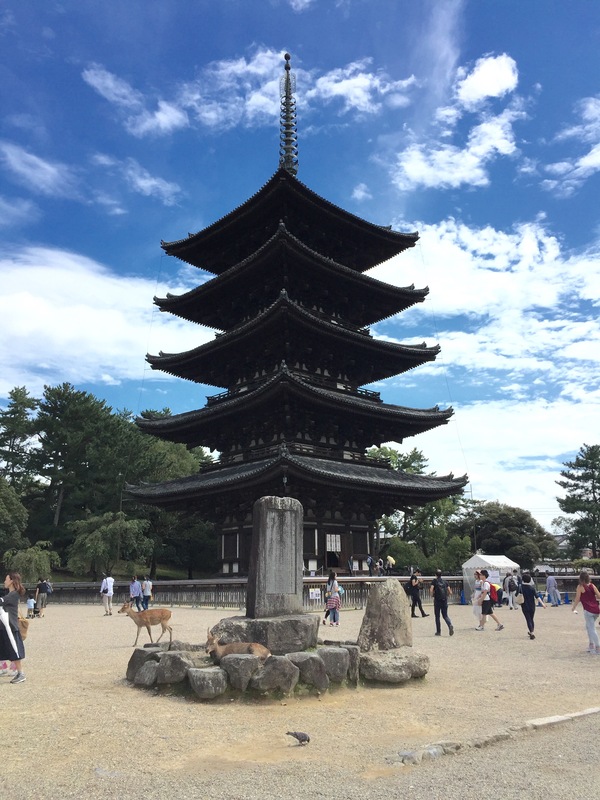 Nara Park is located at the foot of Mount Wakakusa. 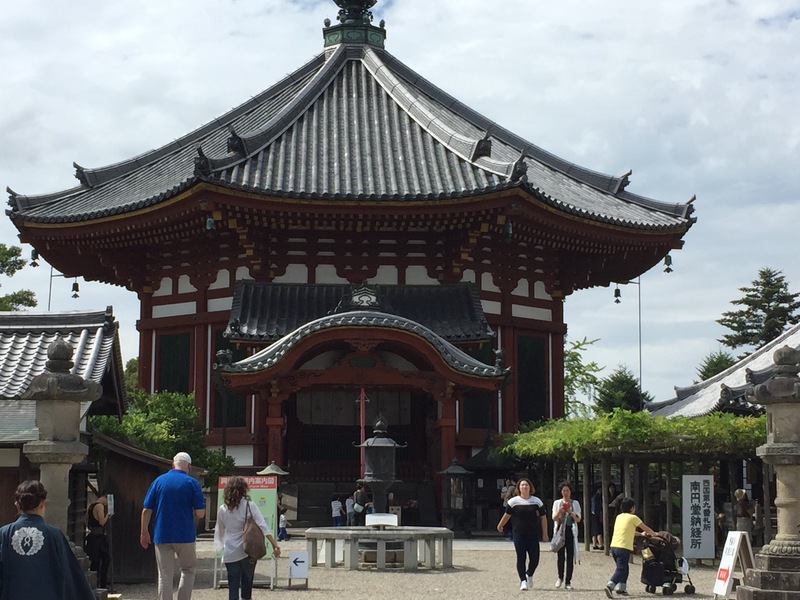 Established in the 1300’s it’s considered one of the oldest parks in Japan. 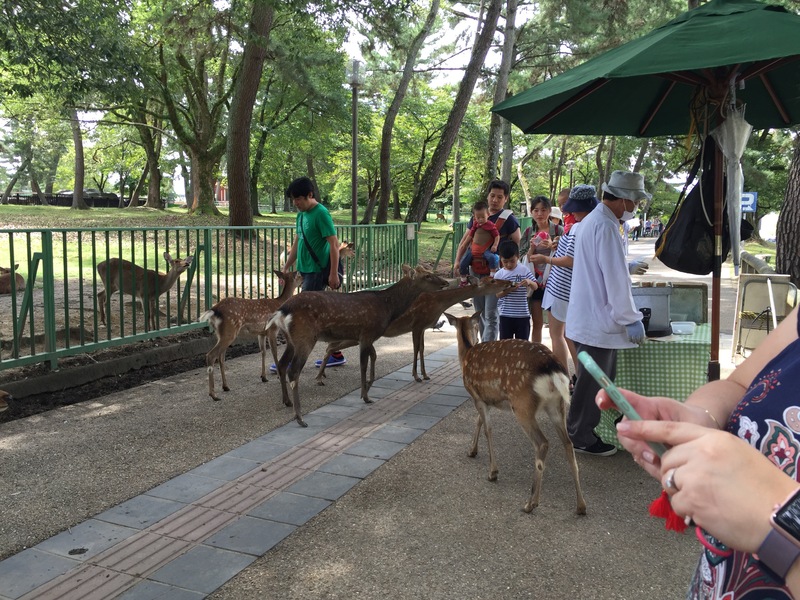 The park has over 1200 wild sika deer roaming around. They have been tamed by the number of visitors who give them food. 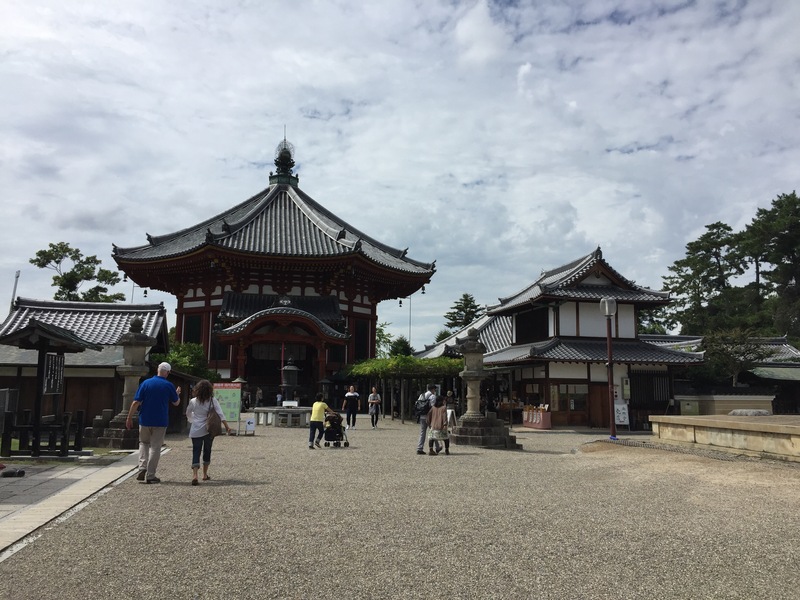 The park also contains the Todai-ji, Kofuku-ji and Kasuga Shrine. 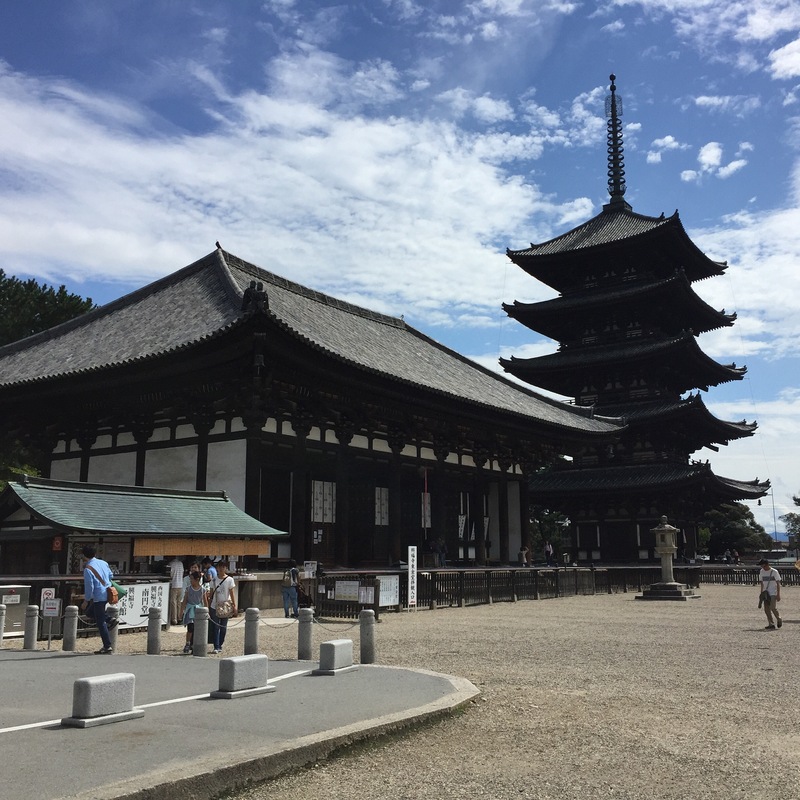 We didn’t see the Todai-ji but it’s the largest wooden structure in the world and it houses the largest statue of Budda (50′). First, we saw the deer. 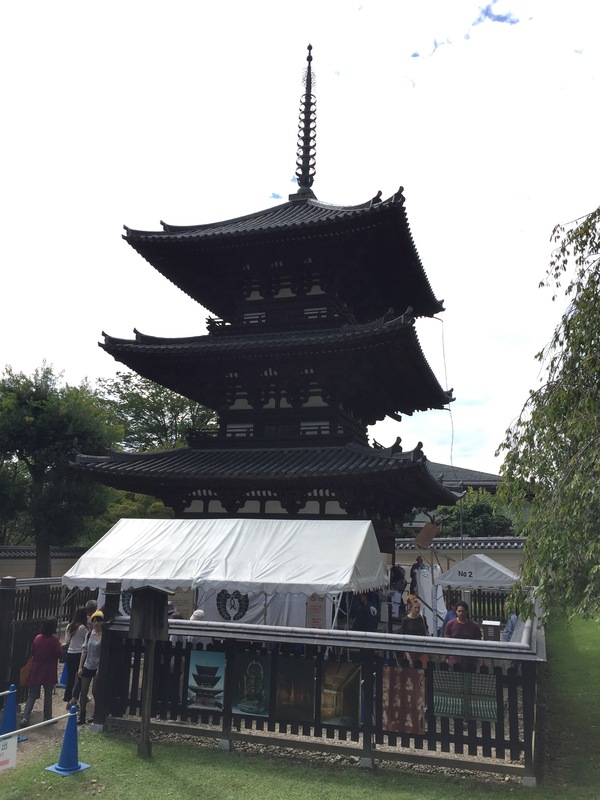 Then, we approached the Kofuku-ji with the Five-Story Pagoda beside it. A little further is the Daian-ji temples hondo. After walking around we grabbed a quick bite to eat at a cafe. Then, exhausted we headed back. It was pretty hot and humid but it happened to be the only day we saw the sun for a while. Wednesday morning we hit a few stores in Tokyo before enjoying a fantastic lunch at Kobe Beef Kaiseki 511. A very nice meal and another nice experience. After picking up our luggage at the hotel we took a taxi to Tokyo station to catch the Shinkansen to Osaka. When we bout our tickets it was for the next train that was coming in just 7 minutes. We huddled purse up and onto the waiting train. However, in hindsight we should have exchanged our tickets for the next train after that which would have given us more time to get to the tracks instead of rushing. But I think we all we’re too tired to think of it. Anyhow, we made it and we are here. This hotel room still uses a key (instead of a card)! 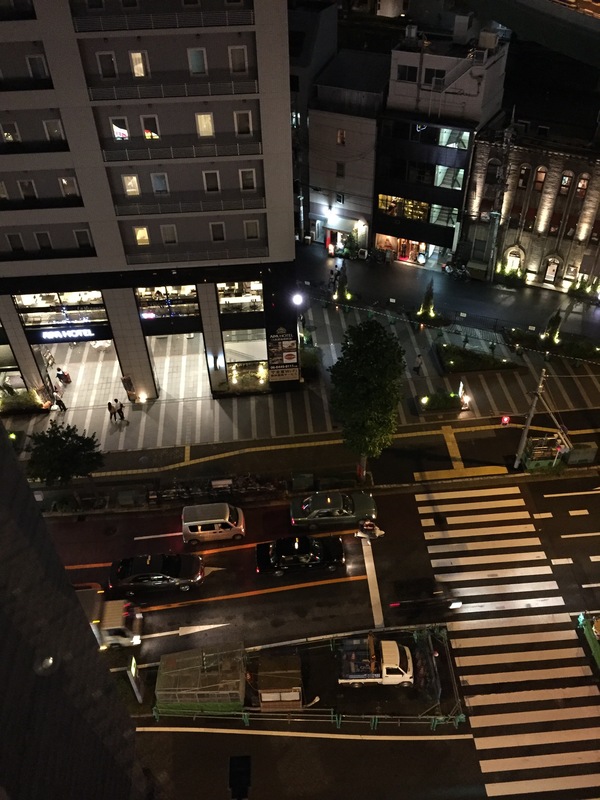 Here’s a view from a window just outside our room on the tenth floor. Here’s a picture going over one of the bridges. 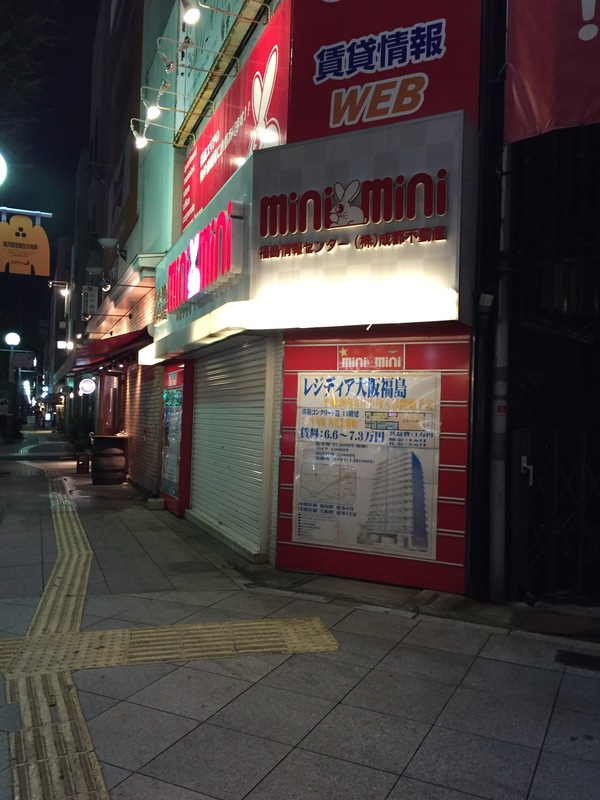 And on a nearby street while looking for something to eat. 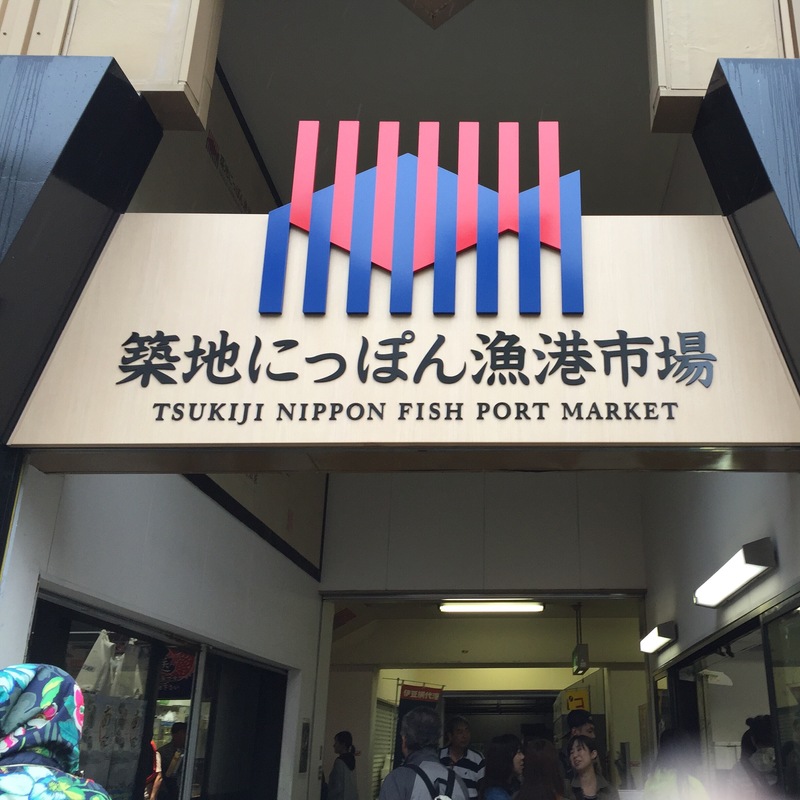 We started our day to light rain and a walk to Tsukiji Fish Market. The main bidding activities happen early in the morning and were finished. 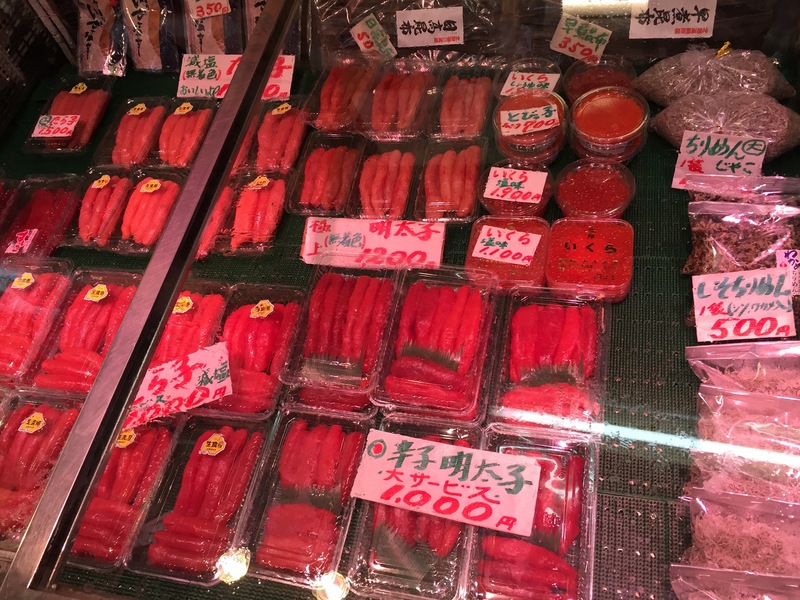 However, we explored the outer market. We then took the subway to Shibuya station for some shopping for the girls. Lots of stores and big department stores in the area. We took a walk to Loft where we spent some time. It has nine floors to explore. 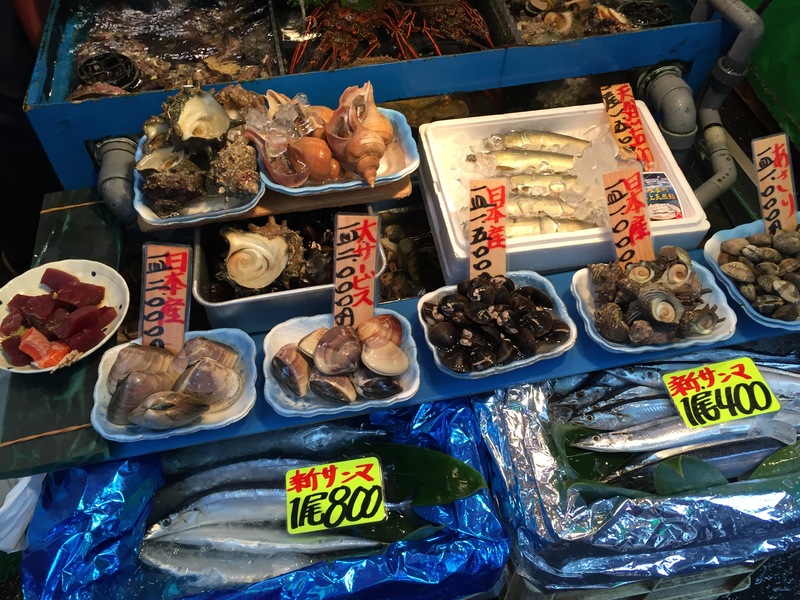 We then made our way back to prepare for our meal at Ginza Sushiichi. I will make another post for this with more detail. But just an incredible experience. Here’s a short video of the mass of umbrellas crossing at Shibuya Scramble Crossing on this wet day. For dinner we had reservations at Takazawa Bar. The main restaurant was closed but they served a similar tasting menu here. It’s a Japanese-French fusion type restaurant. Our server/host for the evening was a young Canadian-American man. Born and raised in Windsor and studied in San Francisco. 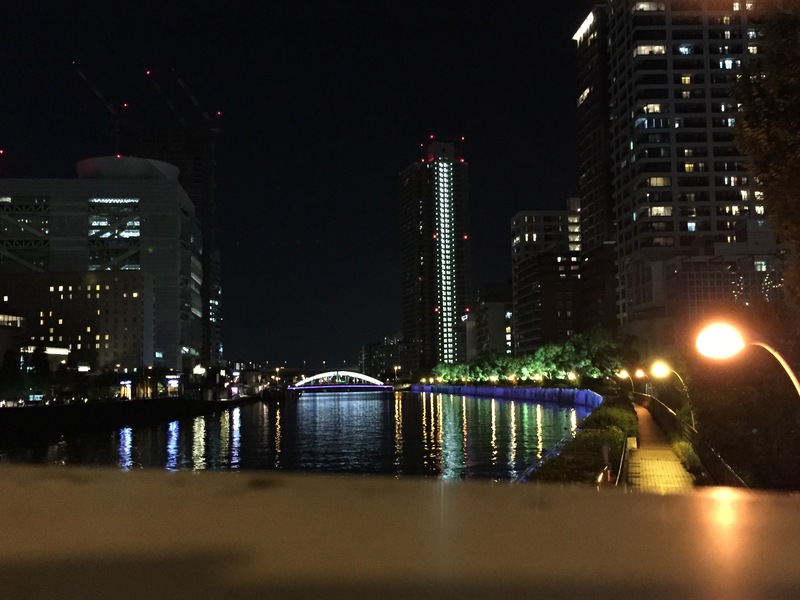 He said he always liked Japan and was finally successful at landing a job there. This made conversing with him a bit easier. Our meals were paired up with first, a white wine and then a red to finish off the evening. Each item was an artistic masterpiece. 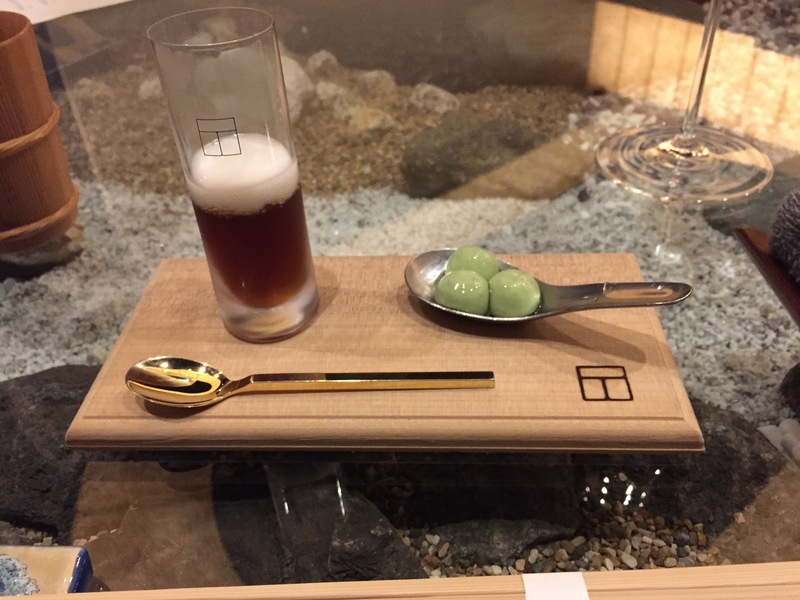 Started off with a shot of seafood beer and edamame in a spoon which was like a self contained soup. Next was a salad, with the individual pieces prepared separately and then grouped together. Served in a stylish spoon with a pepper corn and couple of grains of salt. 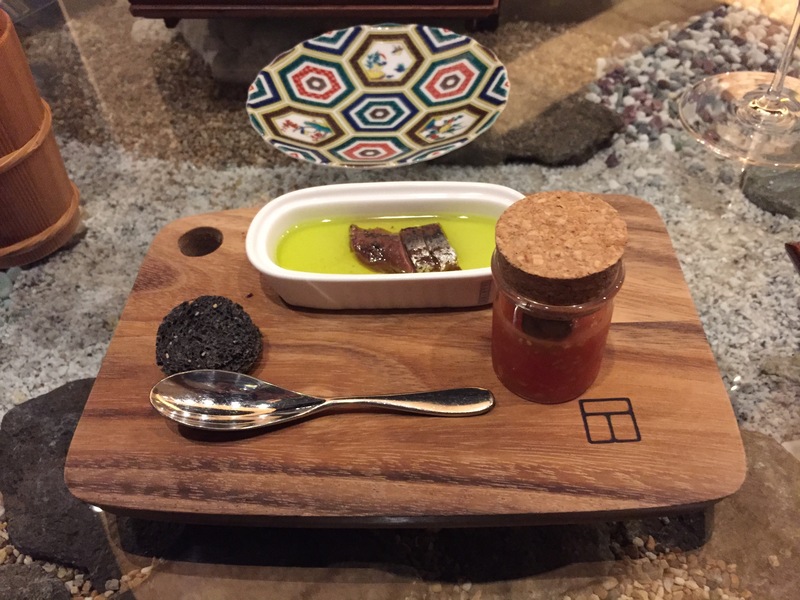 Next, was sardines served in olive oil served with crackers, bread and diced tomatoes much like salsa. 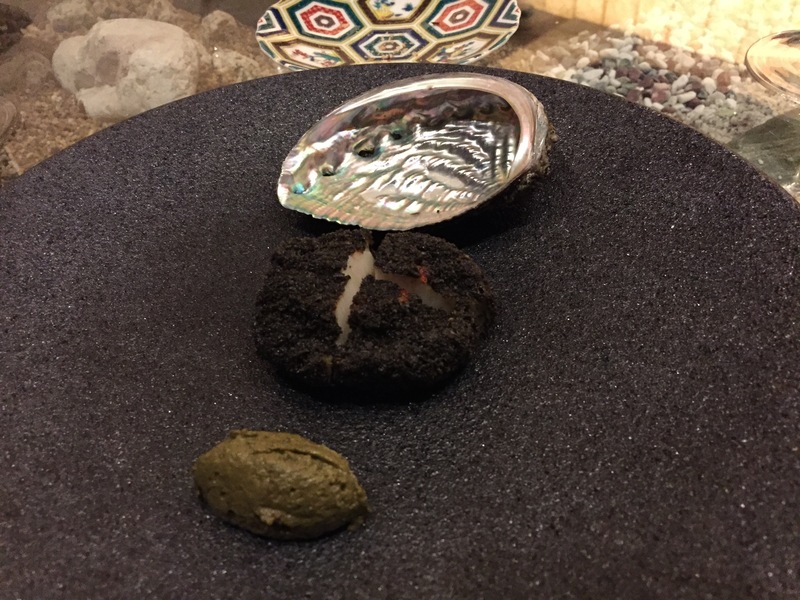 Next up was abalone served with its shell on top and a sauce made from extracts of itself. Next was corn soup. They brought it with smoked corn kernels inside the bowl covered with wrap. Upon opening the wrap they poured the soup over top. 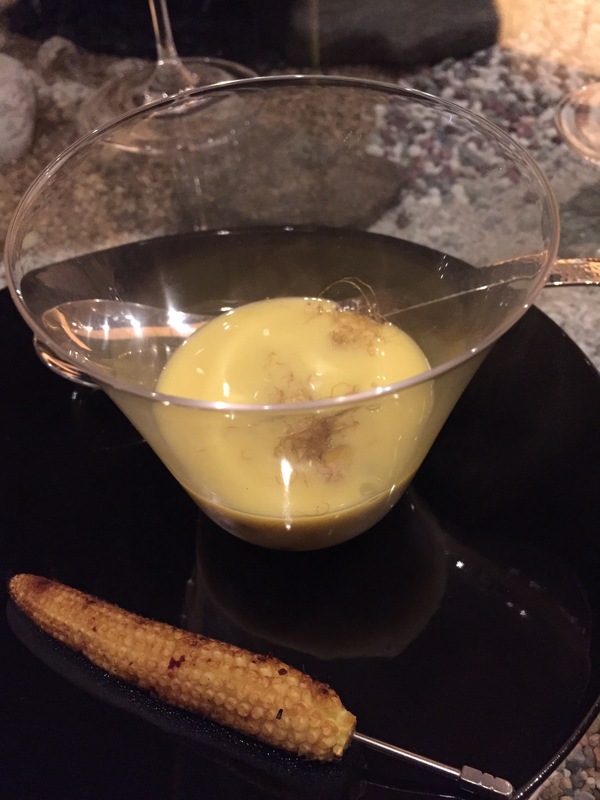 A little baby corn to dip served on the side. 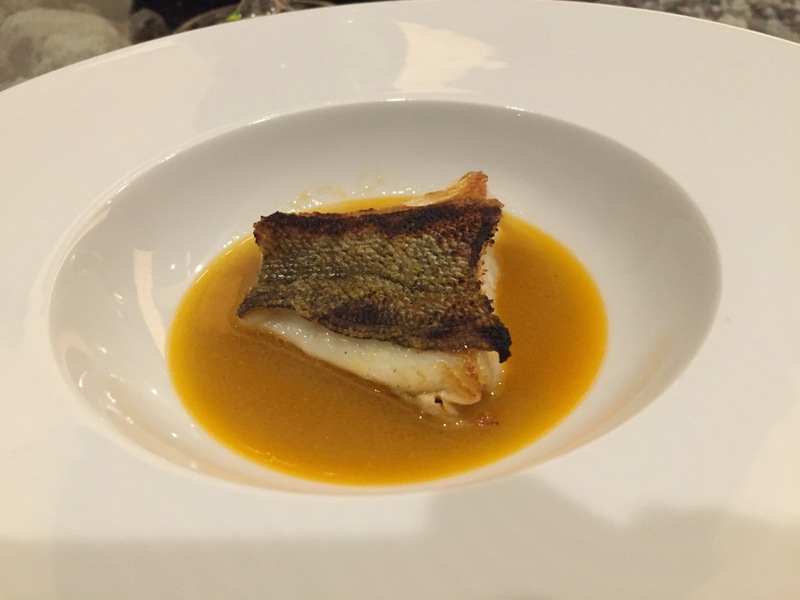 Next was a grilled fish from northern Japan, served in a smokey sauce. 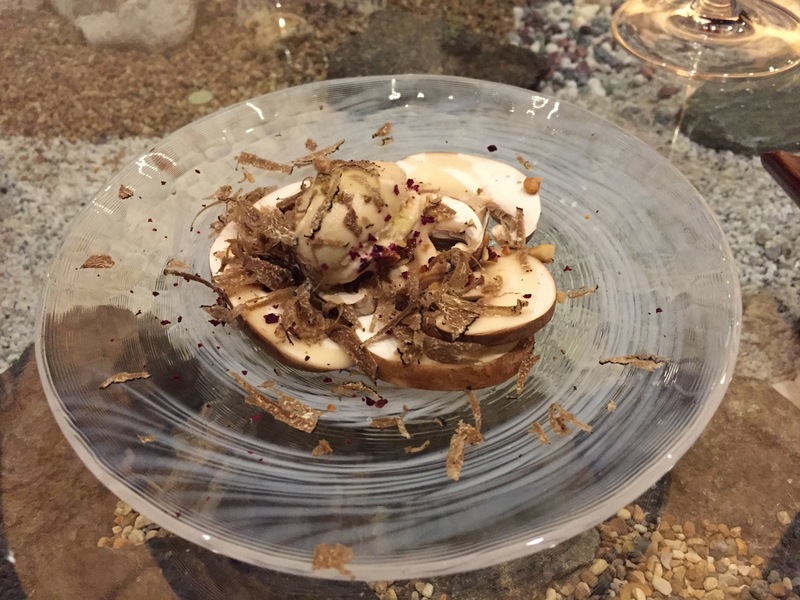 Next was a mushroom salad served with herbs and truffle shavings. Next was figs. After serving, they poured frozen olive oil on top. 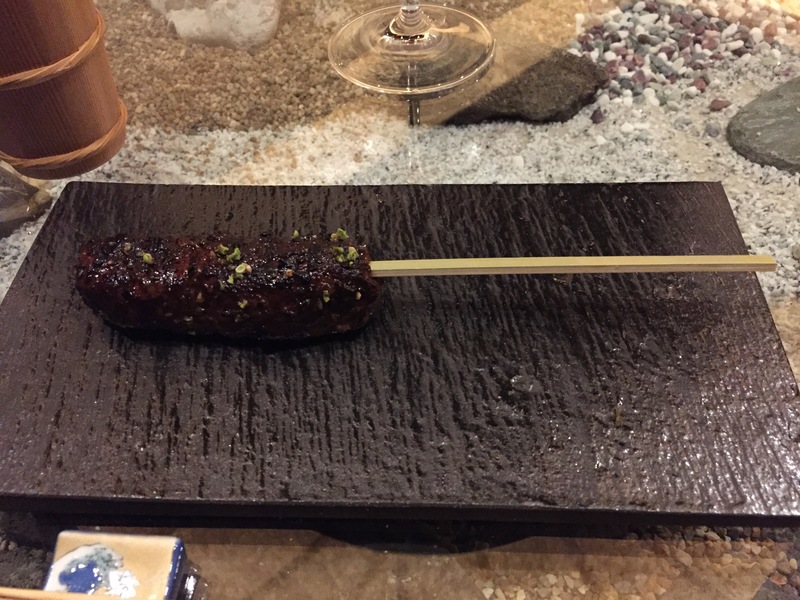 Next was seasoned bear meat from northern Japan on a skewer. I had never tried bear meat before. It tasted like ground beef on a skewer. 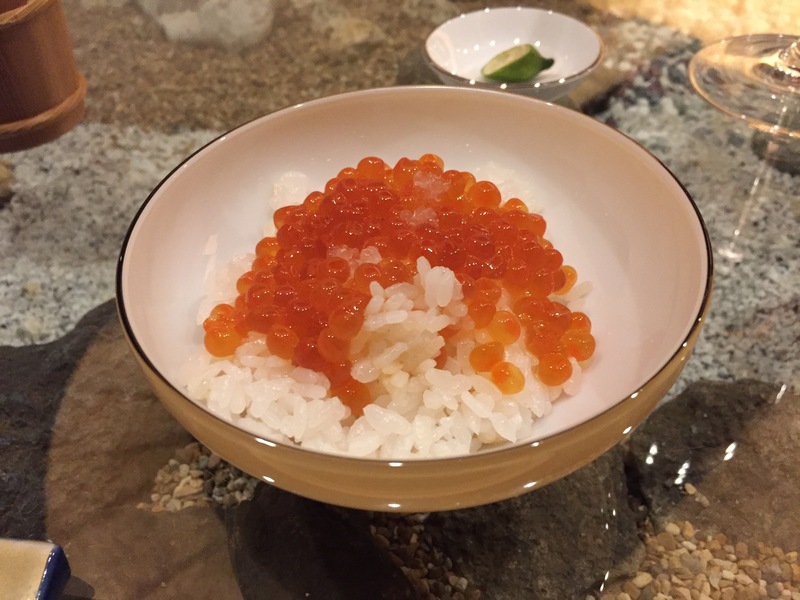 Finally, ikura (salmon eggs) on rice. Prepared nicely the ikura was not over powering. It was quite the experience to enjoy a meal like this. Everything was delicious! !